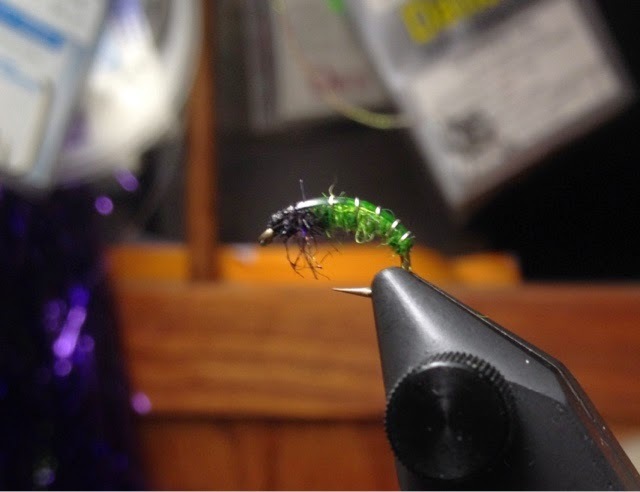 The Green Rockworm is one of the most common and one of the more effective nymphs you'll see people using here in western Maine as well as just about anywhere there's cold water and rocky streams. I use a ton of variants from the simple stuff like a brassie with green wire to the more involved stuff. They all work! No need to get picky about hooks here most scud hooks will work great but I really like the European competition hooks. One layer of flat lead. Very fine silver wire for rib. Green net print on clear scud back or thin skin, plain clear would be fine too. Finish by hitting the thin skin over the black dubbing with a black sharpie.